These 10 PowerPoint shortcuts will help you repurpose themes from other presentations, play sound across multiple slides, discover hidden keyboard commands, create custom slideshows, and save your presentation as a template for future use. Once you’ve set up the animation properties for one item on your slide, you can quickly apply those same settings to other items you want to animate so you don’t have to redefine the animation for each individual item or object. To apply animation properties from one item to another, select the item that has the animations you want to copy and press Alt-Shift-C. Then click the item you want to have the same animation. If you have multiple items on the slide that need the same animation, just double-click the Animation Painter button in the Ribbon and then click on each item on your slide. When you want to apply a theme from one slide deck to another one, use this quick tip from a menu that may not be immediately obvious at first. Open your new PowerPoint deck that needs the theme. This brings up the somewhat hidden Reuse Slides menu and it will appear on the right side of your screen. Find the deck with the theme you want to use and then right-click or Ctrl-click any of the slides and choose “Apply Theme to All Slides.” If you click a single slide, it will add that slide to your new presentation but will use the current presentation’s theme unless you check the box to Keep Source Formatting. This tip will help you play background music across some, but not all of the slides in your deck. Here’s how. Click once on the speaker icon that appears on the slide where you insert an audio file and click Playback in the Ribbon. Under the Stop playing section of the Play Audio dialog box, select “After” and enter the number of slides that you want to be accompanied by music. 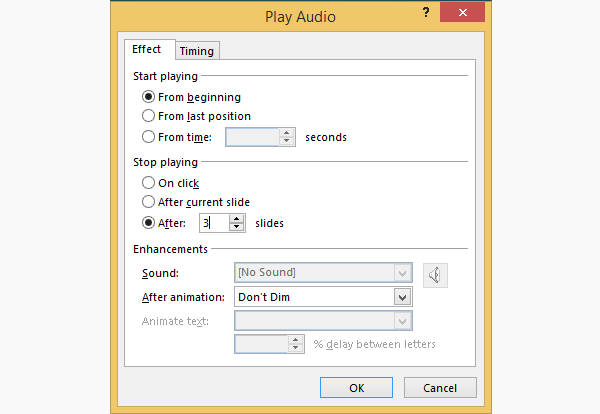 PowerPoint will stop playing the audio during your presentation after that many slides. Use this tip to make sure that the fonts in your presentation always look the same when you send the presentation to someone else. 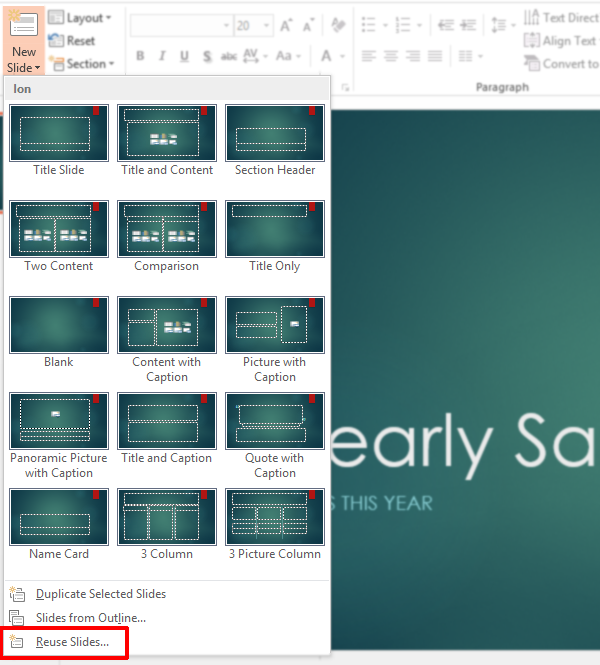 Now, whenever you save the presentation, PowerPoint will include the fonts used so the presentation can edited and continue to have the same formatting. When working on your presentation, there are eight different views to choose from in PowerPoint. You can quickly jump between each of them using this reference guide. Learning keyboard shortcuts in PowerPoint is a sure-fire way to work more efficiently. But how do you find out what all of them are? Fortunately, Microsoft has a keyboard shortcut that exposes even more keyboard shortcuts! In PowerPoint, press Alt-h to expose every available keyboard shortcut for each command on the Ribbon. When you’re presenting your slides, use the Presenter View feature to expose the Slide Zoom feature. Just click on the magnifying glass icon, select the area you want to zoom into, and click. Zoom back out by clicking the Slide Zoom icon again. You can fill your slide headline with an image if you know where to look. 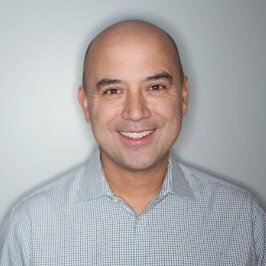 Let’s say you have a presentation chock full of information and you need to present it to your executive staff, the sales team, and the marketing team. However, you want to share different portions of your deck to each audience. 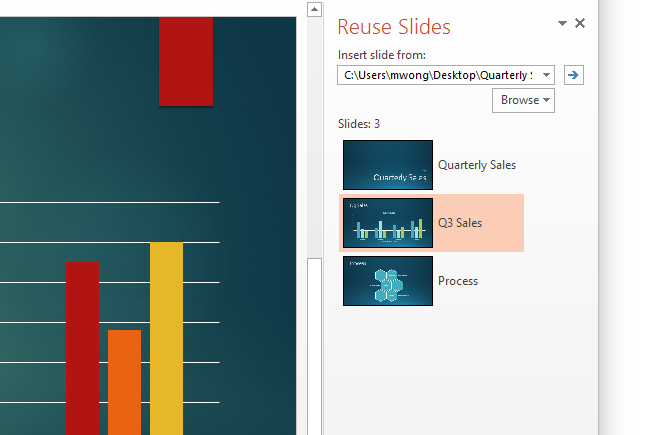 Rather than duplicating and customizing decks for different audiences, use the Custom Show feature in PowerPoint. This will allow you to have a single deck, but different variations that you can show to different audiences. Go to the Slide Show tab, then choose Custom Slide Show. Give your show a name and add the appropriate slides. When you’ve perfected your deck and want to save it for future use as a template in PowerPoint, choose Save As instead of Save. 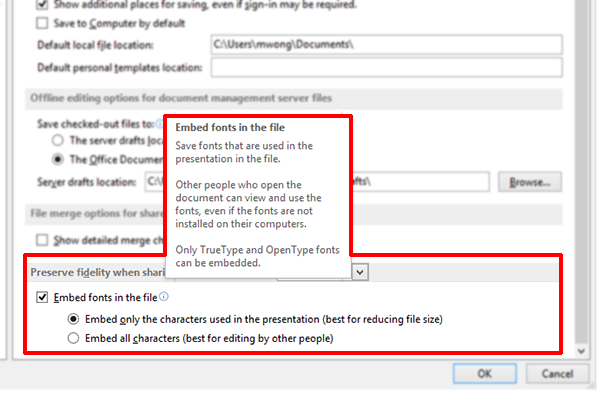 In the Save As dialog, choose PowerPoint Template as the file type and click OK. Looking for more PowerPoint shortcuts? Check out the Lynda.com course, PowerPoint 2013 Power Shortcuts.